If there is a dark side of all our computing power, social networking and email-on-all-the-time, it is the impact this has on battery power. This challenge has remained throughout many devices on multiple platforms and Windows Phone is no exception. I jokingly stated on Twitter last night that 4G will only add to this problem. Fortunately with the release of Windows Phone 7.5 (Mango), Microsoft has built in a way to save that precious battery power. It is called the Battery Saver in your phone’s setup and in this How To I will show you how to set that up along with another battery saving tip. This How To only applies to Windows Phones powered by the 7.5 update (Mango) as the feature I’m describing was added in Mango. 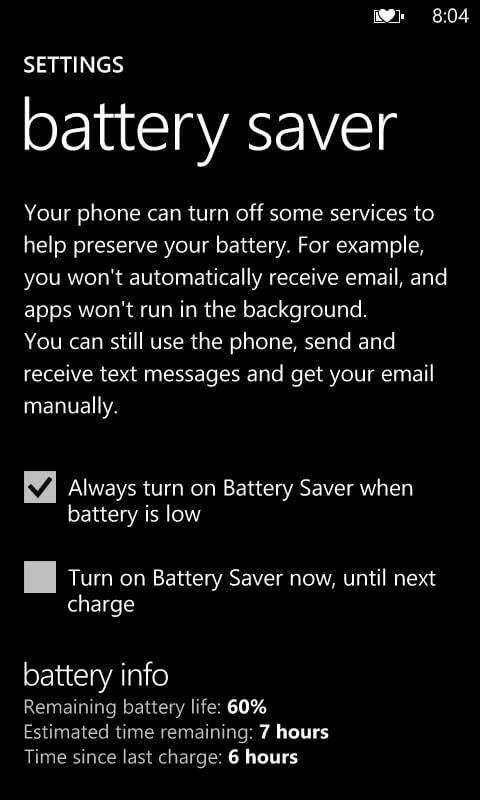 The idea behind the Battery Saver setting in Windows Phone is to allow your phone to selectively turn off services and disable automatic mail downloads amongst other battery saving things. It will also disable applications from running in the background. It only makes these changes when your battery is less than 20% of life left. Otherwise it keeps things flowing and running as normal. Because Battery Saver only turns on when my battery is low, I leave it enabled all the time. It assures me that I know my phone will go into a conservation mode of sorts when I may need it most – to make an important or emergency phone call – at the end of the day. 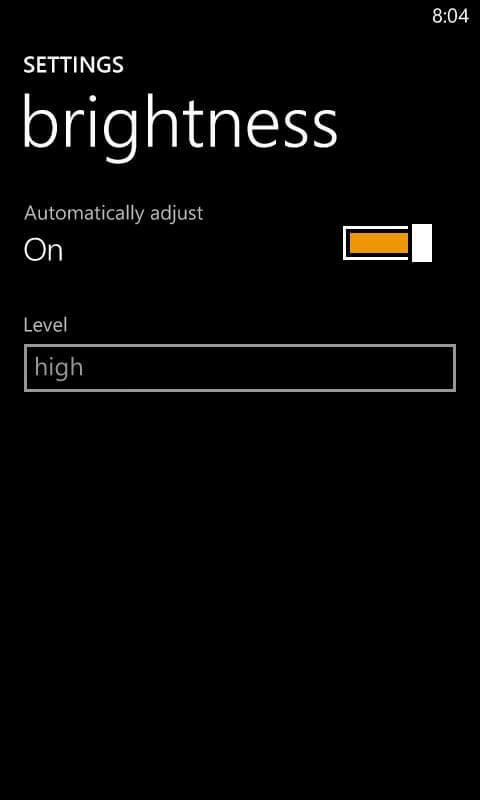 To enable Battery Saver, go to Settings>System>battery saver on your Windows Phone. Tap it and you will get the option to enable the function when your battery is low or to immediately turn it on. If you turn it on immediately then it effectively shuts down the services and email checking immediately as if it was on low battery. You will also note on the bottom of the display a section named battery info. This gives you the amount of battery life you have remaining as well as the estimated amount of time remaining based on your previous usage. 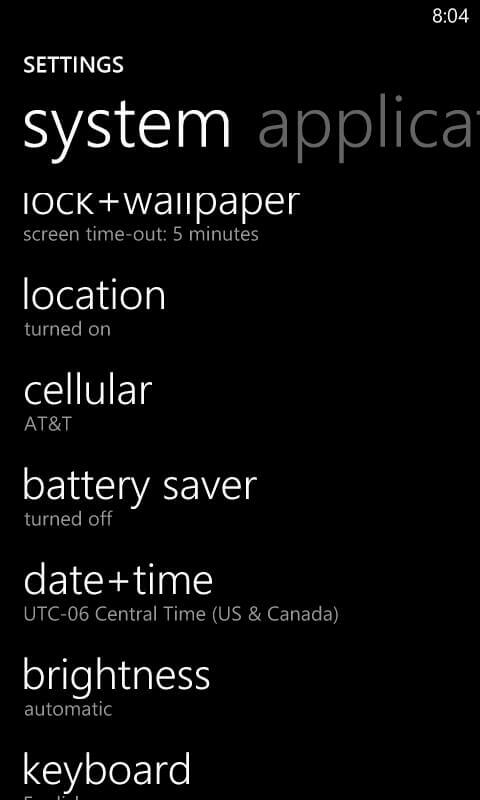 It will also tell you the last time you charged your Windows Phone. There is another way you can save some of your battery power and that is by making sure that your display brightness is set correctly. This is set to automatic adjust by default so unless you have changed it, you should be good-to-go. To double-check it or change it, go to Settings>System>Brightness and make sure the Automatic Adjust is turned on. If you really want to go into battery saving mode, set the Automatic Adjust to off and the brightness level to Low. Given how good the displays are on Windows Phones, I usually leave mine in Off with the brightness set to Low. There are other ways to conserve your battery like using WiFi instead of your 3G antenna when possible. 3G antennas use more power than WiFI and that can help stretch out your battery life. You can also set the display to power off after a minute or 3 minutes. 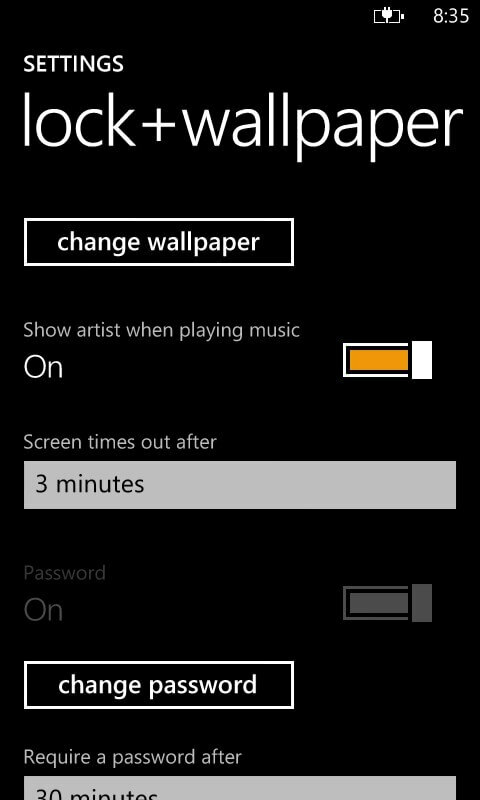 This is adjusted in Settings>System>Lock+Wallpaper section on your Windows Phone and you adjust the Screen times out after setting. If you are having trouble making it through the day on your Windows Phone, try the tips in this How To and see if you can stretch it out a little further. For me they have made a big different on my LG Quantum and allow me to get through a full 12 hour day with still plenty of battery left for the evening.